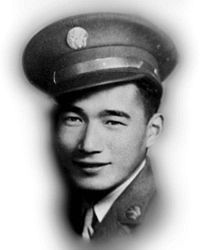 Private First Class William Kenzo Nakamura (21 January 1922 - 4 July 1944) was a U.S. Army soldier who was posthumously awarded the U.S. military's highest award for valor, the Medal of Honor, for his actions during World War II. Nakamura grew up in Seattle, WA, and was interned at Minidoka in Idaho during World War II. On 4 July 1944, Nakamura was serving as a Private First Class in the 442nd Regimental Combat Team. Near Castellina, Italy, that day, he single-handedly destroyed an enemy machine gun emplacement and later volunteered to cover his unit's withdrawal. He was then killed while attacking another machine gun nest which was firing on his platoon. For his actions during the battle, he was posthumously awarded the Army's second-highest award for valor, the Distinguished Service Cross. A 1990 review of service records for Asian Americans who received the Distinguished Service Cross during World War II led to Nakamura's award being upgraded to the Medal of Honor. In a ceremony at the White House on 21 June 2000, his surviving family was presented with his Medal of Honor by President Bill Clinton. Twenty-one other Asian Americans also received the medal during the ceremony; all but seven of them posthumously. Citation: Private First Class William K. Nakamura distinguished himself by extraordinary heroism in action on 4 July 1944, near Castellina, Italy. During a fierce firefight, Private First Class Nakamura's platoon became pinned down by enemy machine gun fire from a concealed position. On his own initiative, Private First Class Nakamura crawled 20 yards toward the hostile nest with fire from the enemy machine gun barely missing him. Reaching a point 15 yards from the position, he quickly raised himself to a kneeling position and threw four hand grenades, killing or wounding at least three of the enemy soldiers. The enemy weapon silenced, Private First Class Nakamura crawled back to his platoon, which was able to continue its advance as a result of his courageous action. Later, his company was ordered to withdraw from the crest of a hill so that a mortar barrage could be placed on the ridge. On his own initiative, Private First Class Nakamura remained in position to cover his comrades' withdrawal. While moving toward the safety of a wooded draw, his platoon became pinned down by deadly machine gun fire. Crawling to a point from which he could fire on the enemy position, Private First Class Nakamura quickly and accurately fired his weapon to pin down the enemy machine gunners. His platoon was then able to withdraw to safety without further casualties. Private First Class Nakamura was killed during this heroic stand. 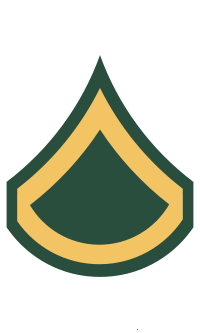 Private First Class Nakamura's extraordinary heroism and devotion to duty are in keeping with the highest traditions of military service and reflect great credit on him, his unit, and the United States Army. The William Kenzo Nakamura United States Courthouse in Seattle, WA, is named in his honor. Private First Class William Kenzo Nakamura was killed in action on 4 July 1944. He is buried at Evergreen-Washelli Memorial Park in Seattle, WA, in Section LX, Lot W, Grave 28.